1. Where was the Crescent Theater? 2. In 1929 dances with live orchestras were held every Thursday night there. What event was held every Wednesday and Saturday? 3. According to the Fall 1904 issue of “The Vermonter” magazine: What state/territory other than Vermont had the largest population of native born Vermonters (1900 census)? 4. What state/territory had the fewest? Clue: The 1900 census included 45 states and three soon-to-be states, AZ, OK, and NM. When we announced the start of the West Wall Capital Campaign (WWCC) we anticipated a year long effort to hit our goal and be ready to start work this coming summer. Six months into it and I'm thrilled to report Tim Chapin, his committee, our Board, and all of you have us 3/4th the way to our goal. Our success has come from a combination of private donations from individuals and businesses, and a hectic fund raising schedule. Some of these events are chronicled elsewhere in this newsletter. We also received a grant of $20,000 from the VT Division for Historic Preservation and have several other grant applications in the works, and we've sent letters to nearly 50 area businesses and corporations. Keep your fingers crossed. 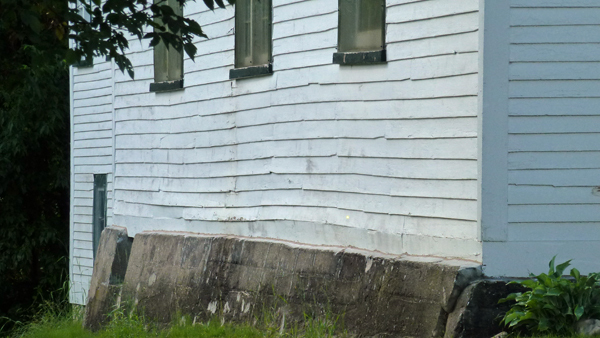 We have never done this sort of thing before so we attended a couple of seminars hosted by the Preservation Trust of Vermont (PTV) as I reported in the last newsletter. The experts on this sort of thing said most projects of this kind are funded largely by individual donors, and typically have one "angel" donor that makes a large donation that makes a substantial impact. We were skeptical, but they were right. 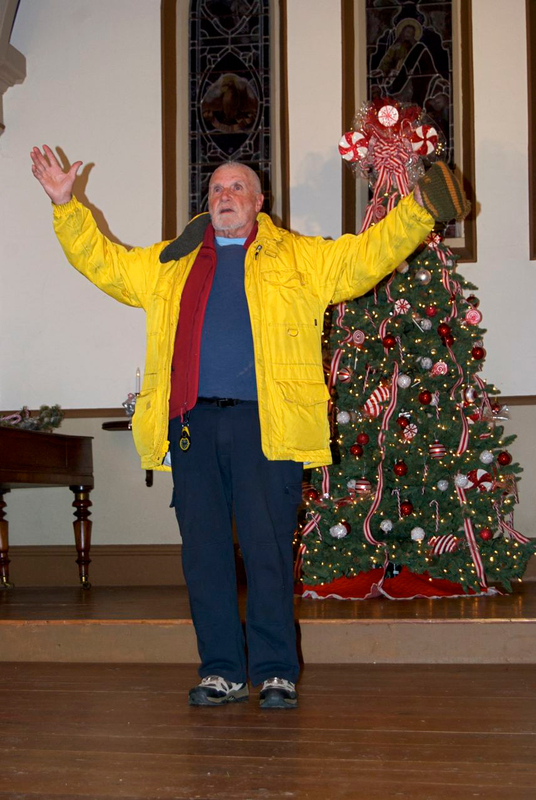 Our angel among angels is Jack Quinn. Jack grew up in Montgomery and has many fond memories of life in our town, especially under the watchful eye of his family, which included his Uncle Carl ("Joe") Scott and his Aunt Irene Scott. Irene and Joe were stalwarts of the community and involved in almost every facet of life here. Irene taught school, ran the library, was an author and poet, and a community organizer. Joe was a farmer, politician, Road Commissioner and worker, store owner and more. Together they ran the store in what is now the Trout River Traders building, and for many years ran Eagle Lodge (now the English Rose Inn). Joe was largely responsible for organizing the effort to extend the Jay Road (Rte 242) from where it ended in Montgomery to the new Jay Peak ski area and hence the Town of Jay below in the late 50s. Jack has a deep love for our community and feels strongly for the MHS mission of documenting and preserving our shared heritage. We all benefit from knowing about our past and those who came before us, those who shaped this place and its collective psyche. Jack has great stories too. Our overall number was down a tad but contributions were up, coming in at just under $12,500. 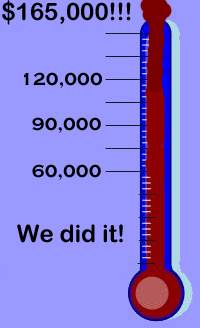 It was another spectacular effort by all of you, and by Marijke Dollois, our membership chair, especially considering we have been running the West Wall Capital Campaign at the same time. Thank you all once again for the sustained strong support. This general fund money pays the bills for the routine upkeep of our properties, like painting the former Heaton House, and the many programs we sponsor, like concerts, scholarships, exhibits and this newsletter. A big expense this year will be the publishing of the 3rd edition of the Town History. It is being printed as I write this and will be going to the binders probably in early February. Our up front cost will be substantial so we hope they sell well, and will eventually see a profit. 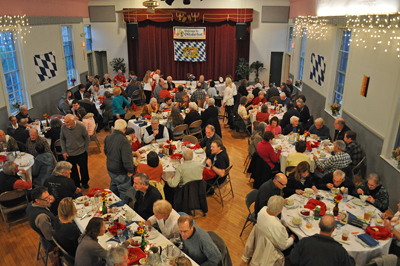 We sold out, and had a waiting list for, our Oktoberfest Dinner fund raiser. People were already asking why we don't do this every year? Nearly 30 people generously volunteered to work the event or donated items for a small silent auction. Our special thanks to Elsie Saborowski, chief cook and meal organizer, and Sue Wilson for handling reservations and seating. In November we hosted a Texas Hold'em Tourney. Thirty players competed at the Town Hall with the Society being a winner too. We will host another one March 16th. Call Sue Wilson for more details. We are also partnering with the Black Lantern for a venison/game dinner brunch January 26th. This early dinner (or late lunch) will be by reservation only and feature the cooking by Matt Crowley. Call Sue Wilson for your spot. Our engraved paver bricks continue to be very popular with about 75 sold so far. They are available via our web site or by contacting Pat Farmer. Speaking of our web site you can purchase hats, t-shirts, and other items or just make a donation at www.montgomeryhistoricalsociety.org/mhs4sale.html, "Don't let the Hall's wall fall". It's not too late to get a 2014 "Then and Now" calendar! It has 15 images of town ranging from the early 1900s to 1972 and the approximate view today. (Lois and Sonny Lumbra are in the car in the photo for February.) Thanks to Suzanne Dollois for volunteering her photo, design and layout talents. The calendars are for sale at the Town Office, Lutz's Automotive, and on line via our web site, in fact we've shipped one to California and one to Georgia from internet purchases. Proceeds are being used for the WWCC fund. Last newsletter we reported about hosting the Vermont Covered Bridges Society and giving them a presentation on our limited knowledge of the covered bridge building Jewett brothers. Since then the Society was contacted by John and Susan Roberts, a couple with an unusual hobby; they purchase old photos at flea markets and antique stores and then research them and try to re-unite them with descendants. They had one of Savanard Jewett, probably labeled by his niece, and since he had no direct family they asked if the Society would like to give it a home. They had also unearthed a few details about his younger years when he was missing from the Montgomery census. Seems he was living in NH and working in a shoe factory before returning to Montgomery and getting into the family business headed by Sheldon. 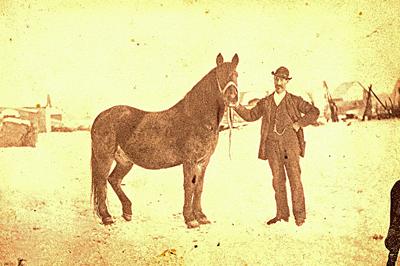 Savanard with horse. Anyone recognize the location? 2. New fangled motion pictures, now with sound, were shown twice a week. 3. Massachusetts had the most native born Vermonters in the 1900 census with over 40,000 living there. 4. The fewest native born Vermonters in the 1900 census lived in South Carolina - 50. As you know we have been the beneficiary of the TD Bank Affinity program for the last four years, receiving about $32,000 in that period. MHS members who are also bank customers designate us as their Affinity charity and TD Bank makes a donation annually based on the members' average annual balances. The program is changing but you will automatically be enrolled if you have designated us for the old program. - $50 for every new checking account and $10.00 for every existing checking account. - 1/10 of 1% of your annual average balance in your savings accounts or CDs as long as the balance at the end of the year period is greater than at the beginning of the period. Our period begins in June, so if you have one cent more in your account at the end of May that balance will be included in the Bank's computation. We are very grateful for this generous program from TD Bank and appreciate our members' participation. Please call your local branch if you have any questions or want to join or designate the MHS. 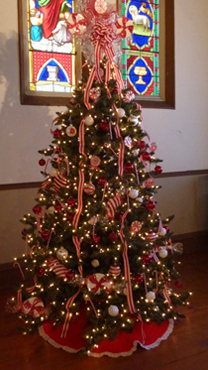 It was below zero outside for our annual Member's Christmas Social but warm inside the sweetly decorated Pratt Hall which was festooned with peppermint lollipops, candies and candy canes. We had a good crowd who enjoyed relaxing, sipping wine, and exploring the variety of potluck finger foods. Thanks to Sue Wilson for pulling the gathering together and to all who brought noshes. 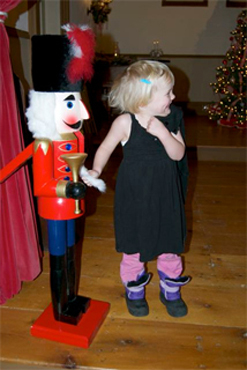 Decorator Noela McGroarty and her merry elves did it again to the delight of young and old. Thank you!! 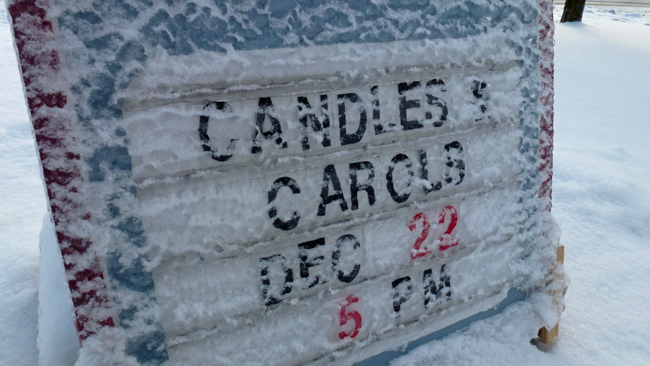 Sign with 3/4 inch of ice Dec 24th! January 1867: The Montgomery Baptist Church was dedicated. February 1979: MHS granted 501.c.3 tax exempt status. 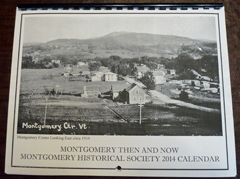 March 1802: Montgomery organized as a Town, First Town Clerk and Selectmen elected. A new group has organized in Town to do what they can to preserve the 147 year old Montgomery Baptist church building. They resurrected the name Montgomery Town Association (MTA) and they've enacted bylaws which state: "The mission of the MTA will be to work toward preserving the former Baptist Church building while simultaneously moving toward having the Church property converted to the general use and benefit of the community at large." Their Board is headed by MHS member Everett McGinley and includes two MHS board members, Sue Wilson and Marijke Dollois. We hope to support their efforts to keep this icon a permanent part of our Town. 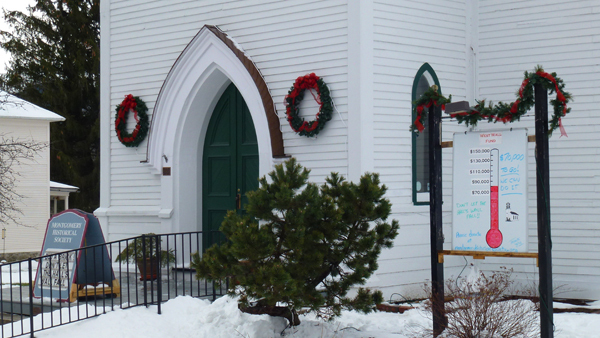 We appreciate the herculean efforts of the Baptist congregation, and the interim group which included some MACA members, in taking care of the building which has played such a large role in the religious and civic life of our Town. The MTA is looking for members and community support, and your ideas. You may have noticed the addition of lights and the traditional wreath and lighted trees for the holiday season. Expect more initiatives from this small but enthusiastic group. The MHS was one of 50 applicants for this round of grants and one of 17 awardees. 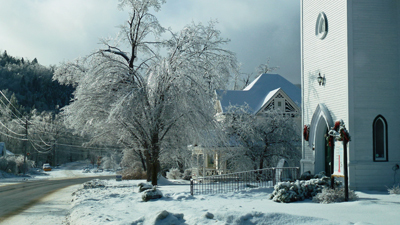 Our thanks to Caitlin Corkins at the VT Division of Historic Preservation and the Vermont Advisory Council on Historic Preservation for selecting us to receive one of their 2014 grants. This is a reimbursement program so we will need the cash to pay the bills then receive grant reimbursement. This our second of these grants. In 2010 we received a $7,500 grant for the Tower project. The clock is still stopping and we continue to trouble shoot it. We think the weight that provides the power to the clock train is binding in its chase. We will keep at it but would like some warmer weather to do the work. We are on the case.